Mothers of sons frequently assume, often rightly so, that attention to detail is not their son’s strong suit. Daughters of fathers often assume, frequently to their chagrin, that their father’s strong suit is attention to detail. In situations calling for responsible action a mother of a son usually looks to her dad instead of her son. If given a choice between youthful exuberance and supposed tempered judgment a woman, say the mother of a bridegroom, will lean on experience, say the grandfather of that bridegroom, when important wedding tasks (safekeeping of the wedding rings, for example) must be performed. This was the dilemma facing our daughter, Heather, last Saturday when she worried her son, Alec, might lose the wedding rings if they were entrusted to his care. As I was going to be performing the ceremony at Alec and Arielle’s outdoor wedding at JPeg Ranch, Heather believed she could rely on me to be the keeper of the rings. It had already been decided that the tall grass and uneven land militated against using a child ring bearer. So, it came down to which semi-adult male of the wedding party should be entrusted with the rings. Heather chose me. Hey, I did not volunteer. However, once the mantle was cast upon me I approached the task as most males would have. 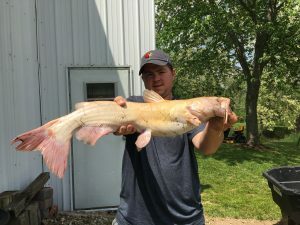 I promptly put the matter out of my mind and concentrated on the large albino catfish that Adrian, the brother of the bridegroom who was supposed to be getting formally dressed as a member of the wedding party, caught in our pond before the wedding. See you have already forgotten about the rings too. Anyway, as I took my place on the antique, moveable bishop’s stand about 10 minutes before the start of the wedding and looked at the podium where I had casually placed both Alec’s and Arielle’s rings, the sense of happy serenity that had pervaded my psyche turned to panic. The rings had blown off into the tall grass. Oh, I could have called for help but then Heather would know, and life is already too short for me to face that. So, I did what any man would do. 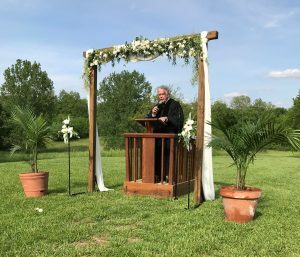 In my suit and black judge’s robe I got down on my hands and knees in front of the assembled congregation and proceeded to sift through the foliage. It was hopeless of course but what choice did I have? Just as I had decided to fake the whole ring thing by using my own wedding band for Arielle to place on Alec’s finger and then covering both of Arielle’s and Alec’s hands with mine as he pretended to place nothing on Arielle’s finger, the heavens opened up and a ray of blazing sun glinted upon bright shiny objects resting against the bottom edge of the wooden bishop’s stand. My first thought was I had better pay this good fortune forward. My next thought was it really wasn’t that big of a deal as All’s Well That Ends Well and Heather might now never know. Hahaha. Great story and expertly told! Unfortunately, Judy, this did happen! Thank goodness the rings suddenly appeared at the right moment!